Widely regarded as one of the most fun and upbeat workouts in the world, Zumba has become extremely popular over the past decade or so. At Seung-ni Fit Club, our Zumba classes are high-energy and exciting, making our clients thrilled to come to class every single time. 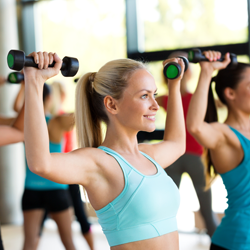 Zumba is a total body workout and works every muscle group, combining strength and muscle conditioning, balance, flexibility, and cardio – in order to maximize your results. Attending Zumba classes regularly has been shown to increase coordination, boost confidence, and improve overall mood. The average Zumba class attendee burns 600 to 1000 calories per Zumba class, and has a ton of fun doing it! It is one of the most adaptable workouts around, making it a great option for everyone from college basketball players to grandmas. At Seung-ni Fit Club, our Zumba classes are basically a big dance party – but better, because you get fit! As with our other classes, we work hard to make our Zumba classes enjoyable and effective. We strive to help you achieve your personal fitness goals, and take pride in the results that we help our clients and participants achieve. We love Zumba (and fitness) and we think you will too. So, if you want to learn from the best, come to Seung-Ni Fit Club. We look forward to seeing you. If you have any questions, comments, or concerns about our Zumba classes, please do not hesitate to contact us at Seung-ni Fit Club today.